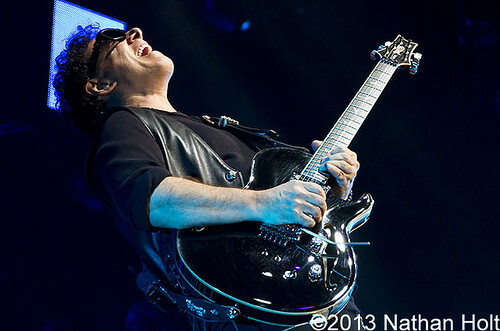 Journey’s previously postponed concert in Fort Wayne, Indiana blew fans away on Sunday. Originally Pat Benetar and Loverboy were supposed to open for Journey in November, Night Ranger stepped in for Pat Benetar, but didn’t end up playing that night because of a band member being sick. The sold out show still gave Journey and Loverboy fans a great performance, even with slightly extended set lengths than other stops on the tour. While Reno constantly encouraged the crowd to sing along with them, the other members primarily rocked out on their own, occasionally traveling across the stage to be next to another band member. The rest of their set flew by with the songs “When It’s Over,” “Lovin’ Every Minute of It,” “Hot Girls in Love,” “Turn Me Loose” and the popular “Working for the Weekend” before the crowd knew it, the set had ended. Journey was next on the stage, beginning with the first three songs “Separate Ways (Worlds Apart),” “Any Way You Want It” and “Ask the Lonely.” From there it was hit after hit, with the crowd singing along with every familiar word that led into lead guitarist Neal Schon playing an energetic and fancy version of the Star Spangled Banner to the crowd. This was followed by “Only the Young,” “Stone in Love” and “Keep on Runnin’,” that featured drummer Deen Castronovo on vocals, giving singer Arnel Pineda a short break from his singing duties that happened a few other times throughout the set. The lighting setup was the same as their tour with Night Ranger and Foreigner back in the summer of 2011, with small LED panels, bright lights and a small runway the jutted into the crowd. For the song “Stay Awhile,” Pineda told the crowd that they had planned something special for tonight and played the song acoustically with just Pineda on vocals and Schon on an acoustic guitar. After the intimate moment, the band asked the crowd to put their lighters in the air for the song “Faithfully” with an extended piano into by Jonathan Cain, who also took over for most of the vocals on the next song “Just the Same Way.” During the whole show founding bassist Ross Valory smiled and winked at the crowd while playing that made many fans smile back in return. Journey blazed through the set of songs, seeming to enjoy every one of them: “Lights,” “Open Arms,” “Never Walk Away,” “Anytime,” “Escape,” “Be Good to Yourself” and “Wheel in the Sky.” The band ended their set with the famous “Don’t Stop Believin'” that included a large explosion and a downpour of white confetti onto the crowd on the floor. The band then came back out and wrapped up the night with their encore of “Lovin’, Touchin’, Squeezin’.” As fans left the building not one person, young or old, could stop from smiling for the great night of music everyone had seemed to enjoy.